The American summer has always been known for the love stories told. The possibilities of a summer romance continue to remain in the hearts of young women everywhere. As we prepare for yet another season of leisure, we reflect on a love story, as American, as the shores of East Hampton. Like every great love tale in our history, also comes the tragic end. The summers of Bouvier, and her prince, are among the greatest stories of the Hampton shores. Jacqueline Bouvier, grew up along the shores of East Hampton, among the most wealthy and prominent residents The ideal prince to most would have been right next door, who knows what those early summers brought to the lovely young Jacqueline. What is known is that her Prince would soon become our Nation’s Leader. There has always been a real feeling of the quest to find love, when it comes to summer. Seems like every single girl every where runs to the nearest designer shop to dress the part of Bouvier Chic, for Jacqueline Bouvier found her prince and became the ever graceful face of the land of the free. Baseball, carnivals, and the coastal paradise of East Hampton have become the staple definition of the American Summer. The ever-romantic idea of a chance for love to blossom, and having the thirst of summer rain, to make it happen is passion behind summer 2011. Could this be the summer? Could this be the time? Who will it be?, are the questions of every summer girl, who’s hearts beat at the same rate of our beloved Jackie once did. 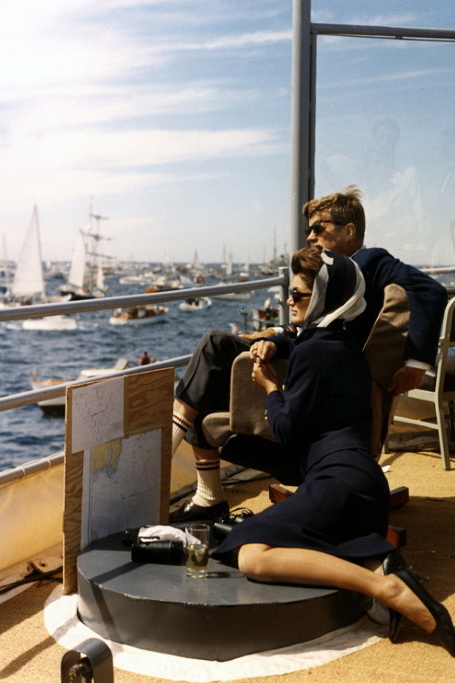 The small town historical girl, in one summer became our Majesty of Kennedy’s Camelot. From one American classic to another, Ralph Lauren, for over 40 years now has been the dressmaker to the future Bouvier hopefuls. Rugby Ralph Lauren Summer 2011, is capturing the youth of our young Jackie, in the moment of her life where the passion was not to lead our country, but rather the moment in which she herself was the young love hopeful searching for her prince. The historic town of East Hampton is enriched with the Nautical lifestyle, the lifestyle as American as Jackie herself, to many, Jackie defined the look, from Navy Blues, seersucker shorts, and Compass Necklaces pointing in the direction to the possibilities of what summer could bring. Kennedy’s Camelot to many was the closest thing to American Royalty. The Royal wedding of William and Kate surely set the mood of Summer 2011. Every girl with summer now dawning upon us, may not have the ideal prince in mind, but will surely know where to go to look the part, RUGBY,. Our Lady Kennedy lived a dream, that to most, thought could never happen. As Americans, the idea of royal weddings and Camelot’s are meant for the storybooks, but Jackie lived it all. However its not the royal aspect of the Bouvier Summers we all find so romantic, its not the First Lady ideal, its not the riches and fame, it was all LOVE, love was and is the thread that continues to fascinate us about Jackie. The love between Jackie and her prince was a symbol to many Americans, the symbol of a Majestic Love, A king and his Queen. Among all the stories of Kennedy’s Rein and the tragic end, the love story remained and continues to be past down from generation to generation. The Bouvier Summers have become an American Tale, as well as an American style. Like they say, Fashion at times is a vehicle of communication, fashion sends messages, fashion states statements, and for summer 2011, Fashion is telling a story. The Bouvier Summers are the mood set for this season, who knows? for summer 2011, may bring to the American People a princess waiting to be our future Queen.